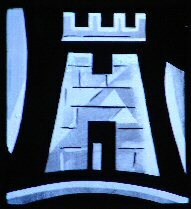 Tower of David . . . 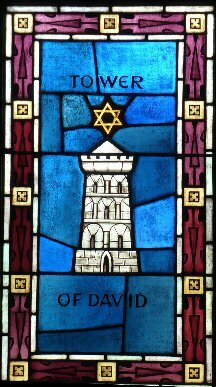 Historically, during the reign of King David, a tower was constructed on or near Mount Zion to aid in the defense of his city, Jerusalem. 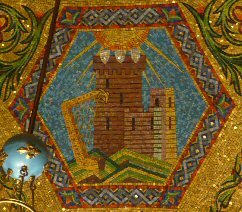 This beautiful Tower of David was adorned with shields, and identified those persons who were counted upon to defend the tower and city when there was danger. 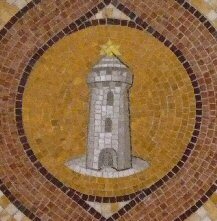 The tower symbolizes Mary, first, because of the virtues by which she is adorned and strengthened as represented by the shields, secondly by the strength with which she defended and protected her son, then, and by extension today as she protects her son's bride, his Church today.